What's the long-term risk of concussion? It's a simple question—and a reasonable one—but the answer, at this point, is elusive. A growing body of anecdotal and research evidence points to an increased risk of chronic traumatic encephalopathy for those who have had multiple concussions, but the matter is far from settled. For athletes and parents of athletes, the lack of definitive data is frustrating. But while the public asks for answers, professional sports leagues—the avatars of their respective sports—have been reluctant to entertain the question. Roger Goodell's National Football League has long been embroiled in litigation related to whether the league had knowledge about the long-term effects of concussions and, until this past March, has steadfastly denied that football-related concussions have any link to CTE. Then, in July, National Hockey League commissioner Gary Bettman responded to questions from Senator Richard Blumenthal (D-Connecticut) by expressing the opinion that there's not enough evidence to positively link concussions and CTE. In summing up his stance, Bettman wrote, "The science regarding CTE, including on the asserted 'link' to concussions that you reference, remains nascent, particularly with respect to what causes CTE and whether it can be diagnosed by specific clinical symptoms." Fortunately for athletes—most importantly still-developing youth athletes, who potentially have several years of play ahead of them—researchers all over the country are studying whether concussions or repetitive head impacts from sports increase CTE risk. 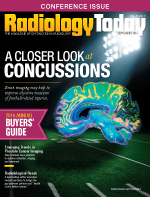 In this month's issue, Beth W. Orenstein examines some of the ways medical imaging is being used to monitor blood flow changes in young athletes' brains, particularly those of football players but including other sports as well. Some researchers believe that microbleeds in the brains of young athletes may prove to be biomarkers for CTE, but one study that should get everyone's attention is that even some players who haven't been concussed have shown signs of brain changes after a single season of play. That doesn't mean that football and other contact sports are irredeemably unsafe, but the results of these ongoing studies bear watching. Perhaps these studies and others like them will eventually provide enough data for athletes and their parents to make informed decisions about the risks and benefits of contact sports and, hopefully, lead to better practices that make the sports safer. That's a proposition that I'm sure Goodell and Bettman would wholeheartedly support.